Narcis Prat collected the Environment Prize of the Government of Catalonia for RiuNet in the category of best initiative. RiuNeT, an app to evaluate the ecological status with the people’s collaboration, conducted by the Research Group Freshwater Ecology and Management (FEM), led by coordinator of TRivers project Narcís Prat, has been honoured with the Environment Prize of the Government of Catalonia in the category of best initiative. TRivers financed the hydrologic part of the app. The awards for innovative environmental projects on citizen science, were given on Tuesday, June 6, on the occasion of the World Environment Day. 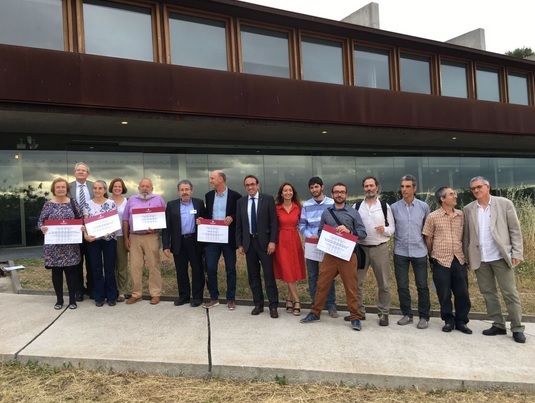 This year, the Environment Prize of the Government of Catalonia honoured the task of four research groups, two associations and the environmental consultant Francesc Giró. Using a phone with camera, internet connection and a geographic positioning system, the app RiuNeT can assess the ecological quality of a river trace following the guidelines of the Water Framework Directive. The final objective is for the observer to collect these indicators and send the results to the researchers. Once they are analysed, they will be available to all water managers and other people who are interested in it. Thus, the jury gave this award “for having brought people closer to rivers and involve them in the assessment of their ecological state, with scientific rigour and experts’ tutoring, but in a dynamic and simple way, with a phone app that guides the participant through a protocol of environmental diagnosis to determine the health status of a river”. Among the new features of RiuNeT, the app will be used in the participation procces leaded by TRivers. The aim of the process will be to involve citizens and stakeholders in order to gather measures for the conservation and restoration of the ecological status of the studied water bodies, in the internal basins of Catalonia, the basins in Júcar River and Ebro. RiuNeT is integrated in the research lines of the Citizen Science Office, an initiative launched by the Direction of Creativity and Innovation of the Culture Institute of Barcelona (ICUB) in which several research groups look for citizen participation in scientific research with collective experiments, according to the Horizon 2020 guidelines. The app RiuNeT has been developed with the collaboration of the Scientific Culture and Innovation Unit (UCC+i) of the Communication Area of the UB and the funding of the Spanish Foundation for Science and Technology (FECYT) – Ministry of Economy and Competitiveness. The company Fusta has been in charge of the creation of this app. It has also received a financial aid from RecerCaixa to finance the server and necessary maintenance to receive and manage data sent by the users.